Yahoo! 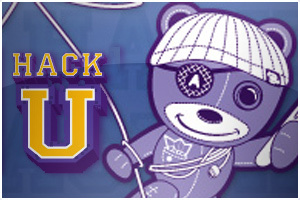 Announces Hack U™ Spring 2011 Series ! Yahoo! is proud to announce the Hack U™ Spring 2011 calendar of events. Join Yahoo! web experts for a week of learning, hacking and fun! You’ll hear interesting tech talks, hacking tips and lessons, and get hands-on coding workshops where you’ll work with cutting-edge technology. The week’s events will culminate with our University Hack Day competition—a day-long festival of coding, camaraderie, demos, awards, food, music and jollity (it’s a real word, look it up). It’s not about perfect code, just your creativity, a cool idea and a working prototype. You’ll have access to tons of APIs and tools in the Yahoo! Developer Network (check out YQL, the YUI Library, Flickr and BOSS just to name a few). No rules or limitations - just show up and hack for your opportunity to win cool prizes, a spot in the gallery, street cred and the chance to represent your school at the University Hack Showdown in California. This is your shot to develop something that will revolutionize the industry, make the world a better place or at least make the judges laugh (trust us, that goes a long way! ).